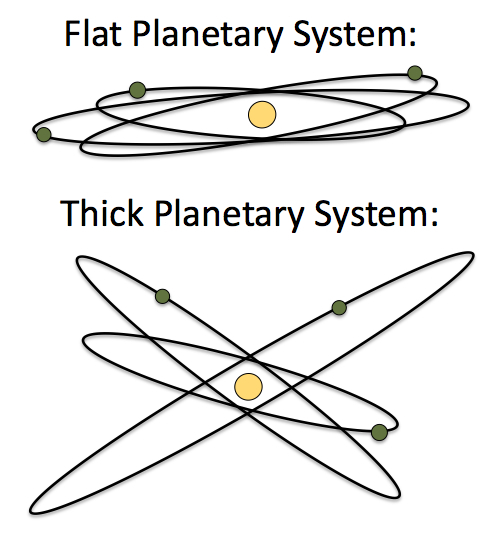 By figuring out the architecture of planetary systems, such as the alignment or misalignment of planetary orbits, we can provide important constraints on planet formation and evolution models. For example, well-aligned planetary systems (like the Solar System) are consistent with a standard formation model of planets forming in a protoplanetary disk. Planetary systems with misaligned or inclined orbits can be indicative of past events that increased their inclinations. As a result, information on the alignment or misalignment of planetary systems can reveal clues to important planet formation and evolution processes. 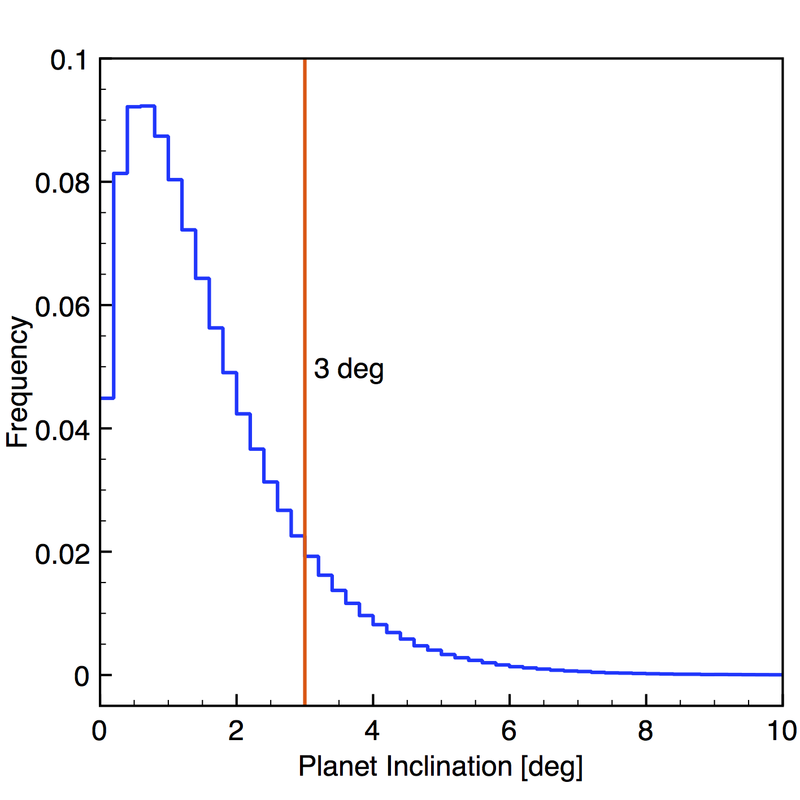 Recently, Jean-Luc Margot and I used the latest planet candidate catalog released by the Kepler team to perform a statistical analysis of the inclinations of planetary systems. To do so, we created artificial planetary systems, simulated observations of them by the Kepler spacecraft, and compared their properties with the actual Kepler planet detections. Our best-fitting models showed that most inclinations of planets are less than 3 degrees — implying a high degree of coplanarity! Such alignment is also consistent with planetary orbits in the Solar System, with the exception of Mercury. To put these inclinations into perspective, Jean-Luc made a batch of pancakes and (ignoring the first and last pancakes as outliers) measured an average thickness and an average radius of the pancakes. This corresponded to inclinations of six degrees. Crepes, on the other hand, were too thin. 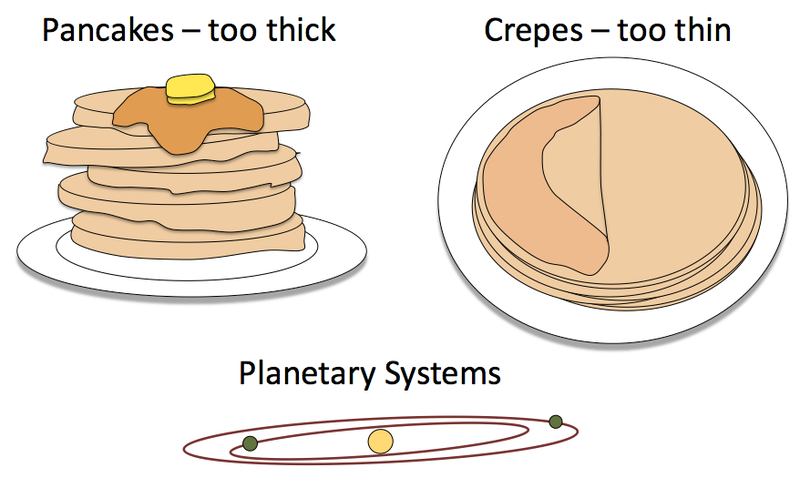 Consequently, the best mental image for the geometry of planetary systems (with inclinations less than 3 degrees) is somewhere between that of a crepe and that of a pancake. Interesting results! What about the alignment of planetary disks with the galactic disk? Is there a correlation between the two? The galactic magnetic field lines thread through the galaxy’s molecular clouds, and I wondered if that would leave its mark on the planetary disk alignments after cloud collapse into stars.